This league produced an upset winner last year in the NCAA Tournament as Buffalo stunned Arizona and future #1 overall pick DeAndre Ayton in blowout fashion. That team is back again and has spent a majority of their year in the top-25. That all being said, they will have some challengers this year. Toledo is on the bubble coming into the tournament, Bowling Green has played well and Northern Illinois beat Buffalo in DeKalb. I wouldn’t say the league is up for grabs but Buffalo doesn’t have to win the tournament to get into the NCAAs and there will be some hungry teams looking to steal a bid. This team can win because they did it last season and have only gotten better from there. They have multiple stars on this team, all of whom have the ability to take over a game. The biggest addition to this year’s team is depth. The bench has played well when guys like Caruthers, Jordan, or McRae get in the ball game, they are effective. The Rockets do a lot of things right. They rebound well, they can score it, and they play defense. Their depth doesn’t match up with Buffalo but no team in this league does. Toledo relies on strong free throw shooting and rebounding. In order to upset the Bulls and win the league, they will need to improve from downtown. Why can Bowling Green win this league? Because they’re Falcon awesome! Shoutout to my dad who loves that joke and got a shirt when we visited BGSU in 2011. Justin Turner and Demajeo Wiggins are the real reason this team can win. They’re a strong inside-out combo that gives the Falcons good size and rebounding inside with a good shooter. They will need to carry this team. Jaylin Walker, need I say more? The senior guard has had an outstanding season averaging over 20 points per game and improving his shooting. He still isn’t the best shooter (sub-40% from both the field and 3) but he’s a volume scorer and gets his shots up. This team as a whole doesn’t shoot the 3 well and if they can pick it up, and the defense, then they have a chance to make a run to the dance. The Chippewas go about 6 deep, or at least that’s as much production as they get. Their starters are all average double-figures and as a team they rebound the ball pretty well. Central Michigan does not shoot the 3 that great, the good news is the guys who do shoot it often from downtown hit it pretty decently. The Chippewas know the offense is going to come, but the defense is hit or miss. They don’t want to be getting into shootouts every game, but if they do they need to know they can get a stop when they need it. EMU boasts a good duo in the paint with James Thompson IV, who averages a double-double, and Boubacar Toure outside of those two, they do have Paul Jackson who leads the team in scoring, but not too much else. The Eagles are one of the worst 3-point shooting teams in America hovering right around 30%. They need to play to their tempo, get into half court sets and pound the ball inside. Aside from the fact that the Huskies wear knock off Chicago Bulls jerseys they also have a very good player named Eugene German. He does a little bit of everything for this team and strokes it efficiently from the field. 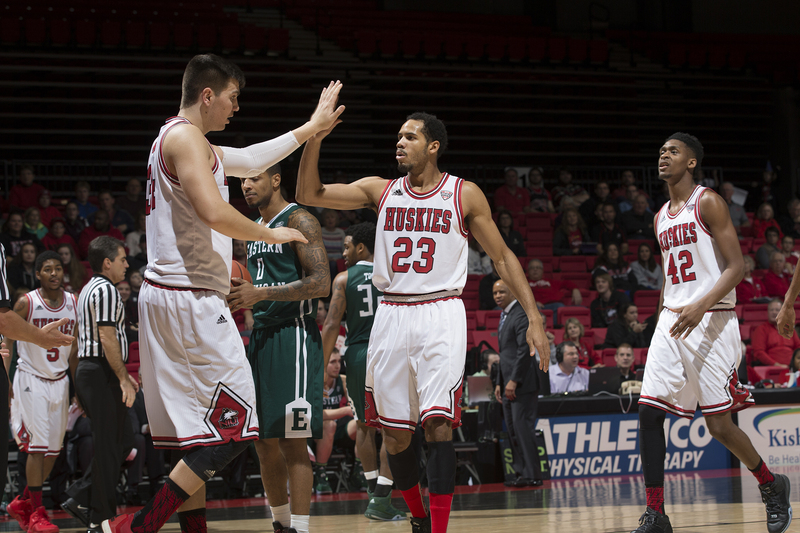 The Huskies need to find their game and dig in defensively. They can score, but not as well as some other teams in this conference and that’s where playing strong defense for multiple possessions comes in, basketball 101. Offense is not something the Zips do well, they shoot the 3 poorly at just over 31% and they average just under 70 points per game. However, this is one of the better defensive teams in the country. They come in at KenPom 27th overall in that category and they’re 18th overall in points per game allowed at under 64. Finding the offense is the key. Can Miami really win the league? Maybe, but the chances are slim. They took Buffalo to the wire a couple weeks ago in a good showing and if they can replicate that performance multiple days in a row, then they can win this league. When you look at the Bobcats, their -4 score differential says it all. They’re terrible on defense, but they are prone to blowouts. They have allowed over 80 points 9 times this season 5 of them in conference play. Offensively it is up to Jason Carter and Teyvion Kirk. Ohio is a horrible 3-point shooting team at right around 30% for the year and they turn the ball over nearly 15 times a game. They need to fix all the issues on offense to have a chance to compete. As one of the stronger defensive teams in the conference, you’d expect Ball State to fare a little bit better. This team really struggles with turnovers. So when they do get those extra possessions on offense they’re essentially wasted. The Cardinals need to find consistent offense outside of their top 3 of Walton, Teague, Persons. The Broncos revolve around their 7-footer Seth Dugan. Dugan has a had a strong year but he alone is not enough to win this team games. The Broncos turn the ball over 15+ times a night and shoot the 3 poorly, although they aren’t the worst team in the conference in that category. They need a miracle to win this league and it starts with Dugan, if he can pull some miraculous 20 and 20 games then they absolutely have a chance.